NBS (NIST) Buffers The use of pH 6 to calibrate offset of pH meters at 6.86 was commonplace not that long ago. This buffer provided better accuracy but was known to be less stable. The introduction of microprocessors into pH meters eliminated calibration trimmers and screwdrivers by automatically recognizing buffers. Yet, this meant that in most cases the microprocessor was not able to distinguish between pH 6.86 and 7.01. As a result the former was dropped in favor of pH 7.01. Hanna has brought this important buffer back into modern pH meters by offering microprocessor portable and bench meters such as HI 9625, HI 9321 & pH 300, which can be calibrated at 6.86 as well as pH 7.01. 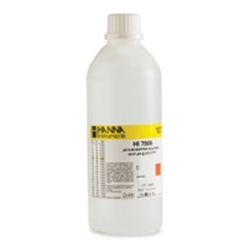 The range of Hanna pH 6 buffers has been extended and the stability greatly enhanced to match that of pH 7. NIST Traceability pH 6 buffer is standardized with a pH meter that is calibrated to NIST buffer solutions. The ingredients are Potassium Dihydrogen Phosphate and Disodium Hydrogen Phosphate and the buffer is traceable to NIST 186Ie and 186IIe S.R.M.